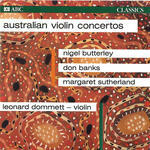 Australian violin concertos / Butterley, Banks, Sutherland. Recorded/performed at: ABC Studio 325, Melbourne, on Aug 72. Don Banks Leonard Dommett, Melbourne Symphony Orchestra, Patrick Thomas 25 mins, 27 sec. Recorded/performed at: Odeon Theatre, Hobart, on Feb 76. Nigel Butterley Leonard Dommett, Tasmanian Symphony Orchestra, Wilfred Lehmann 17 mins, 45 sec. Recorded/performed at: ABC Studio 325 Melbourne, on 19 Dec 72. 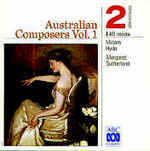 Margaret Sutherland Leonard Dommett, Melbourne Symphony Orchestra, Patrick Thomas 24 mins, 31 sec. This product forms part of the following series: ABC classics; PolyGram classics. Includes programme notes and biography of soloist. Score: Violin concerto / Nigel Butterley. Score: Concerto for violin and orchestra : study score / Margaret Sutherland. Score: Concerto for violin and orchestra : piano reduction / Margaret Sutherland. 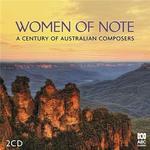 CD: Women of Note : A Century of Australian Composers.